Photograph of a class in the vernacular girls' school at Bombay in Maharashtra from the Archaeological Survey of India Collections: India Office Series (Volume 46), taken by an unknown photographer in c.1873. 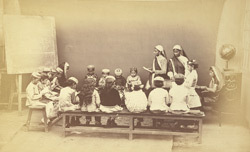 This image, showing the class grouped on benches around the teacher, was exhibited at the Vienna Exhibition of 1873 and is mentioned in John Forbes Watson's catalogue for the Indian Department. Female education in India grew dramatically in the latter part of the nineteenth century and vernacular education (in the local language) was considered a special obligation for the Government from 1854 when it was declared a concern by the Court of Directors. The vernacular course covered both primary and secondary education and was carried out in many different types of establishment depending on the resources of the area. In Bombay, for example, the complete course of vernacular education was delivered at primary school. The Imperial Gazetteer of India states, "The type of primary school varies from the primitive pathshala or maktab to the modern institutions in which the pupils are educated in accordance with approved European methods. The Bombay local rates schools are in general better built, equipped, and managed than the Bengal indigenous institutions."